It is April! And, do you know what that means? The Masters is about to start. 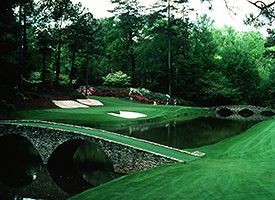 This year’s tournament in Augusta is April 8th through the 11th, and the practice rounds and festivities start on Monday the 5th, 2010. I grew up in the south dreaming of my day, my turn at Augusta National playing in the Masters. Of course, I have had to settle on watching the tournament on television. But, no more! There are ways that you can go to Augusta and watch the famed golf tournament for free. That’s right! That’s not a typo! For Free! If you can get to Georgia, there are a few ways to see Tiger Woods and all the other golfers. Wait Outside The Gates. If you do not mind missing some of the morning rounds of golf, you can stand on the sidewalk outside the main gates of Augusta National golf course and wait for people to leave. Most people who come early in the morning, leave around noon or in the early afternoon and never come back to the golf course. A lot of people simply ask ticket holders for their entry passes after they are done with them and walk in for a few hours to see some of the golfing greats on the fabled course. Volunteer To Work. Several of my fraternity brothers have worked at the tournament for years picking up trash on the golf course. If you do not mind wearing those “cool” white jumpsuits like a caddie, you too can see the Masters and get paid for it! You can’t beat that! Still not working for you? You can always buy tickets from people who already have them. Stub Hub is still selling tickets to all four days of the Masters tournament as well as the practice rounds earlier in the week. And, next year, do not forget to sign up for the lottery which determines who receives practice round tickets. After the tournament is over, you can find information on the Masters Website about the process. That’s a really good idea. Wait outside the gates. Do you have any tips for getting from Colorado to Georgia for free? How can I rec. an application for me and my wife for the Masters golf tournament for 2010 in Agusta, Ga.
How do I apply to work at the 2011 Master’s?